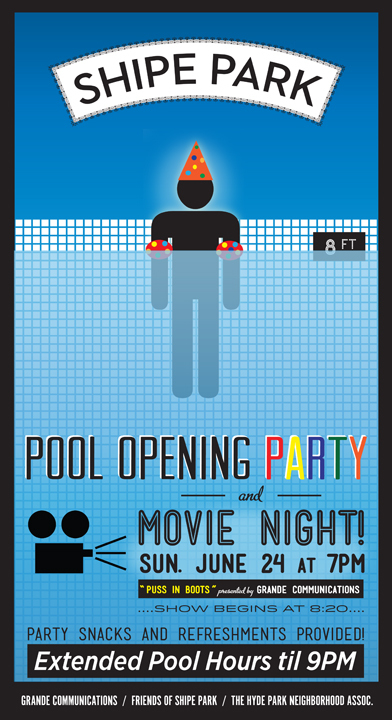 Join for a Sunday evening swim, a movie in the park and s’mores for the kids! Join us for a Sunday evening swim and celebrate our awesome neighborhood pool with your friends and neighbors! The party starts at 7pm, and we’ll have Casey’s Snowballs, popcorn, and s’mores for kids of all ages. At dusk, we’re screening the movie “Puss in Boots” on the lawn for kids and families. The pool stays open an extra hour until 9pm, so bring your suit and a towel, and enjoy the evening with us! The pool remains funded and open to the public only because the community came out in strength last year to advocate for it. Our city leaders heard us loud and clear and passed a budget that funded Shipe Pool for 2012! But the city’s budget deficit remains and Shipe Pool and other neighborhood pools are still on the recommended closure list to close that annual gap. Join us on Sunday and cast another vote of confidence in our neighborhood park and pool! The third section of the Shipe Park Mosaic Mural is being installed now, and it will be on display at the Party! Our friends at the Red River Church have donated a lovely, hand-made silk quilt for us to raffle at the event, so come check it out and buy a ticket to win it! Really special thanks to our event sponsors: Grande Communications, Hyde Park Neighborhood Association, Griffin School, Red River Church, and Casey’s Snowballs! And thanks to all of you who are willing to work to sustain and improve our cherished neighborhood park and pool!